Our first advert is a recently made advert from 2018 for the breakfast show on 98.1 CHFI. It’s set in a typical cafe, with the breakfast jocks mucking in with making the coffees, taking orders. It’s nice how it transitions from the jocks serving the listeners and eventually, it turns into them chatting away at tables and doing the congo. Although I’ve never listened to the show, I can tell it’s a warm, friendly and welcoming vibe that screams fun. 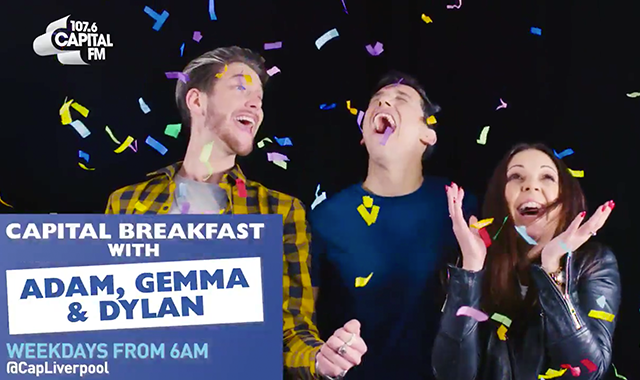 Capital recently set out to make local video promos for each Capital site and their breakfast show. Now, although this is cheating slightly as it’s not a TV advert, the thought remains the same. Capital is obviously a youth brand and therefore a social media advert might perform better for them anyway. Each site has a video but after watching a few I decided the team in Liverpool looked like they had the most fun with it. Back in 2017, Irish station Today FM created one of the most talent driven adverts I’ve ever seen. To be fair, it took a few views before I clicked on it, but this could be because I don’t know the line-up or their personalities. The advert takes you through each member of the lineup and gives each a personal spin on their USP. Without listening to the station I can tell you they have a diverse and varied lineup. Still championing new music back in 2012, Radio 1 put out a TV advert claiming it’s their big thing. The advert is not only impressive in a production sense, but it really drives how that Radio 1 is a big station, it’s national, it’s in your face, and it champions new music. I think we’ve all sat in front of the studio desk and pretended we were really driving something bigger than the output. It wouldn’t be a countdown of some kind if KIIS wasn’t involved, now would it? In 2017 they created a set of adverts (and have rerun them in 2018) based on a focus group. What I love about this advert is that it’s different. Everything we’ve seen so far on this list has been shouting about how great the station/show is. What we see in this advert is quite simply people with nothing but bad things to say about Kyle and Jackie O. It’s well known they’re a Marmite show. All this advert does is re-enforce the characters on air. If you love them, you’ll love them even more.